This article is about the historic house type. For the Clayton I-House, see Clayton Homes. The Dr. Holladay House in Orange, Virginia. The original brick house (ca. 1830) was a Federal-style I-House. Structural failure reveals the interior layout of this house near Craigsville, Virginia. Second-floor rooms on the right side of the house feature doorways into a central hallway. The I-house is a vernacular house type, popular in the United States from the colonial period onward. The I-house was so named in the 1930s by Fred Kniffen, a cultural geographer at Louisiana State University who was a specialist in folk architecture. He identified and analyzed the type in his 1936 study of Louisiana house types. He chose the name "I-house" because of its common occurrence in the rural farm areas of Indiana, Illinois and Iowa, all states beginning with the letter "I". He did not use the term to imply that this house type originated in, or was restricted to, those three states. It is also referred to as Plantation Plain style. Cohasset (c. 1873), with a full shed-roof front porch and rear shed rooms in Hampton County, South Carolina. The I-house developed from traditional 17th century British folk house types, such as the hall and parlor house and central-passage house. 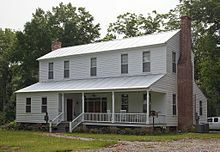 It became a popular house form in the Mid-Atlantic and Southern United States at an early date, but can be found throughout most of the country in areas that were settled by the mid-19th century, especially through the culturally mixed midland, an area through central Pennsylvania and roughly paralleling Interstate 70 through Ohio, Indiana and Illinois (or approximate to the old National Road). I-houses generally feature gables to the side and are at least two rooms in length, one room deep, and two full stories in height. They also often have a rear wing or ell for a kitchen or additional space. The facade of an I-house tends to be symmetrical, and they were constructed in a variety of materials, including logs, wood frame, brick or stone. Because of the popularity and simple form of the I-house, decorative elements of popular architectural styles were often utilized. Front porches and any decoration would be in the restrained Federal manner through the 1840s, or in the Greek Revival style during the 1840s and 1850s. The I-house was also adapted to Gothic Revival and Italianate styles during the mid-19th century, and late 19th century I-houses often featured Queen Anne and Eastlake-Stick style details. In the South a variation of the I-house, with one-story rear shed rooms and usually a full-width front porch, is often referred to as the Plantation Plain house type, though it is more correctly termed as an I-house with sheds. ^ a b "I-House". Encyclopedia of Oklahoma History & Culture. Oklahoma Historical Society. Retrieved 2008-10-03. ^ Fred Kniffen, "Folk Housing: Key to Diffusion," Annals of the Association of American Geographers 55 (1965). ^ Fred Kniffen, "Louisiana House Types," Annals of the Association of American Geographers 26 (1936). ^ a b c Gamble, Robert Historic architecture in Alabama: a guide to styles and types, 1810-1930, pages 29-32. Tuscaloosa, Alabama: The University of Alabama Press, 1990. ISBN 0-8173-1134-3. ^ "2001 Home and Garden Tour". West Central Neighborhood Association. Retrieved 2008-10-04. ^ "Plantation Architecture in Alabama". Encyclopedia of Alabama. Alabama Humanities Foundation. Retrieved 2008-10-03. ^ "Colonial Architecture: Overview". New Georgia Encyclopedia. Georgia Humanities Council and the University of Georgia Press. Retrieved 2008-10-03. Wikimedia Commons has media related to I-houses.